Being in the position I’m in can be very stressful, with lots of uncertainty in the future and I’m not the best at dealing with it. That’s why I’m so grateful for wonderful co-workers who help keep me grounded, make me laugh and always know how to calm me down. They are the best; and while terrible at our short lived diet plans, I still love them. Eating healthy is hard when you work in a dermatology office that seems to have an endless supply of girl scout cookies and leftover cake. So when it was my funniest friend’s birthday, I obviously had to make cupcakes, to contribute to the problem. I toyed with a few flavor ideas, but ultimately decided on turtle because, 1) I had all the ingredients and 2) who doesn’t love a turtle sundae. 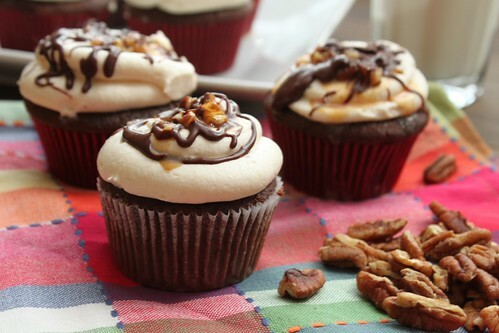 It’s basically a super moist, yet sturdy, cupcake base, topped with a caramel cream cheese frosting, ganache and a caramel pecan filling. “Some people” were a little worried about how nuts would taste on a cupcake, but I assure you, you have nothing to fear. It was delicious. If I had to make them again, I would probably double the caramel and pipe some caramel filling, or scoop some caramel pecan filling, into the center. I also used low fat sour cream (because it’s what I had), but no one complained :-)! To make the caramel, spread the sugar in an even layer over the bottom of a large, heavy-bottomed saucepan. Place over medium-low heat, watching carefully. When the sugar begins to liquefy around the edges, use a heatproof spatula to gently stir it towards the center. Continue stirring very gently until all the sugar is melted, taking care not to over stir. Measure out the heavy cream in a liquid measuring cup and scrape the seeds from the vanilla bean into the cream. Set aside. Once the caramel reaches a deep amber color, immediately remove the sauce pan from the heat. (To test the color, spoon a drop onto a white plate or bowl.) Carefully pour half of the heavy cream into the saucepan in a steady stream down the edge of the pan, whisking constantly. The mixture will steam and bubble violently. Stir until the cream is well incorporated, then whisk in the remaining cream. Stir in the salt and the vanilla. If any sugar has seized or hardened, place the saucepan over low heat and whisk until smooth. 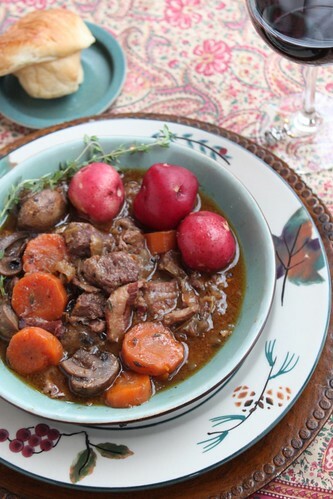 Transfer to a bowl and let cool to room temperature. If you desired, double the recipe and pipe a small dollop of caramel into the center of each cupcake at this time. To make the frosting, combine the cream cheese, butter, and caramel sauce in the bowl of an electric mixer. Beat on medium-high speed until smooth and creamy, about 2 minutes. Mix in the confectioners’ sugar and salt at medium speed until light and fluffy, about 2 minutes more. Transfer the frosting to a pastry bag with a large round tip. Pipe a heavy swirl of frosting over the top of each cupcake. 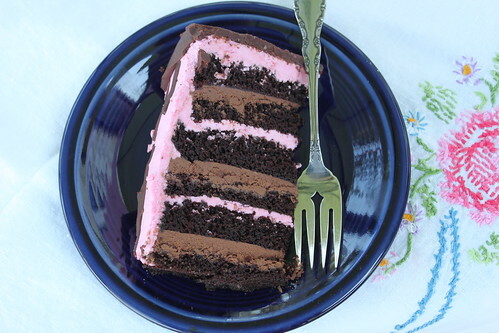 Use the tip of a small offset spatula or a small spoon to scoop an indentation out of the center of the frosting. To make the chocolate ganache, chop chocolate and place in a small bowl. Heat heavy cream in a saucepan or carefully in the microwave until hot. Pour over chocolate. Let sit for 1-2 minutes, then stir until smooth. Stir in 1 T butter. Let sit at room temperature until desired consistency. In a small bowl, mix together of the caramel sauce and the chopped pecans. Fill the indentations in the frosting with a small spoonful of the caramel-pecan mixture. 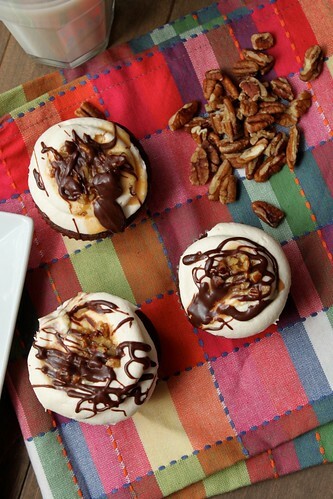 Drizzle the cupcakes with additional caramel sauce, chocolate ganache, and sprinkle with additional chopped pecans, if desired. In case you missed it, the super bowl was this weekend, and…it. was. amazing. While I will never give up hope of seeing a Browns super bowl in my lifetime, the caliber of the patriots vs. seahawks game really made appreciate ‘Merica. Also, can we please talk about that half time show? While I am by no means being unfaithful to my one true love (Taylor Swift), Katy Perry did a phenomenal job. The whole thing was American entertainment at its finest. We had a small get together at our house, in the midst of a terrible snow storm. There may or may not have been multiple difficulties getting both in and out of the driveway, but everyone (amazingly and thankfully) made it both here and back safely. Thanks for braving the weather for us! There was lots of food, including my all time favorite pizza bites, and of course these cookie bars. 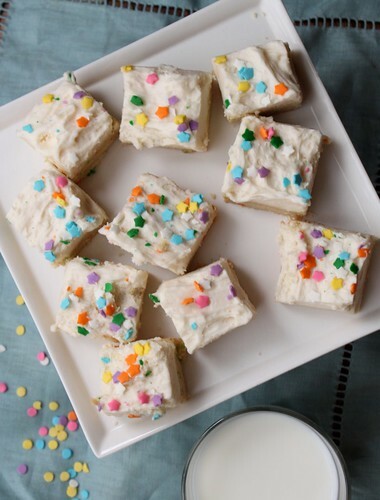 I picked these because they were relatively simple and can be made with ingredients you probably have lying around the house – butter, sugar and sprinkles -so they are perfect for a snow day. I actually used left over halloween sprinkles for the inside, and then some left over stars for the topping. What I like most about these bars is that they can so easily be adapted for any holiday depending on the sprinkles you choose. With valentine’s day around the corner, there may be another batch coming up shortly (I’m sure no one will protest). Preheat oven to 350° F. Lightly grease a 9×13 inch baking dish and set aside. Whisk the flour, salt, and baking soda together in a large bowl; set aside. In the bowl of a stand mixer fitted with the paddle attachment, beat the butter and sugar together on medium-high speed until light and fluffy, about 2 minutes. Beat in the eggs one at a time, beating well after each addition and scraping down the bowl as needed. Mix in the vanilla. Pour the dry ingredients into the bowl along with the sprinkles and mix by hand until flour is just incorporated. On low speed, combine the dry ingredients into the wet ingredients, mixing until blended. Lightly press the dough into the prepared baking sheet. Bake for 12 to 15 minutes. The bars will still look pale with barely a hint of browning around the edges. Transfer the pan to a wire rack to allow the bars to cool completely in the pan. In the bowl of a stand mixer fitted with the paddle attachment, beat the butter for 6 to 8 minutes on medium speed; it will be very pale and light. Add in the sugar, milk, vanilla, and salt and mix on low for 1 minute and then on medium speed for 6 minutes; the frosting will be very light and fluffy. If using food coloring, blend it in until it is fully incorporated. Use an offset spatula to frost the fully-cooled bars in the pan. 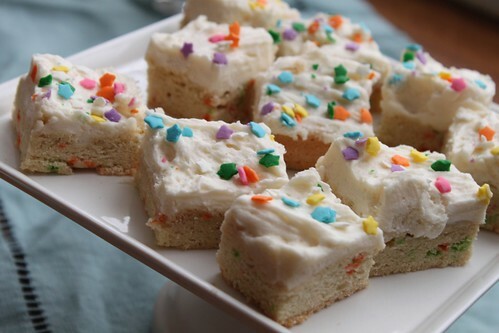 Use a sharp knife to slice them into your desired size and shape, garnish with more sprinkles, and serve. In some parts of the country, it might be a little late for this post; but here in Ohio, we’re still trying to find ways to enjoy fresh garden tomatoes before the first frost hits. Hopefully that first frost will not present itself as 2 inches of snow in the middle of October (like it decided to last year). After the infamous 2013-2014 winter, I’d be fine waiting until Christmas Day for snow, and then having winter be over. For now, I’m still revealing in the fact that it’s beautiful, a perfect 70 degrees, with the garden is still going strong. I felt like being a bit adventurous (per usual) and made ricotta cheese from scratch for this recipe. It was pretty each- basically just heat milk, add lemon juice and vinegar, and then strain over cheese cloth for about 10 minutes. 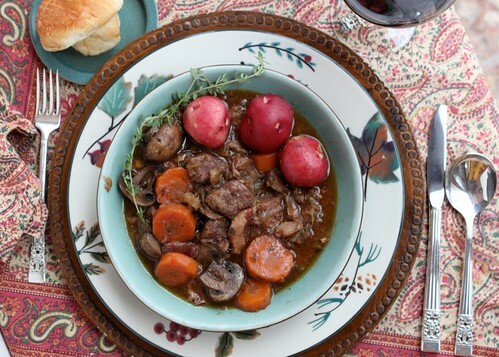 It was fun to try, but it did take this from being an easy weeknight meal to kind of a production with multiple things to clean up. I made the dough for the crust a day in advance, so this was pretty simple when it came to putting together. It really highlights the tomatoes, and lets you hang onto that last bit of summer. Better get on it before it becomes a winter wonderland around here! 1) To make the crust, combine the garlic and basil in the bowl of a food processor. Pulse until finely minced, scraping down the bowl as needed. Add in the flour and salt and pepper to taste, and pulse again to combine. (If you don’t have a food processor, just mince the garlic and basil as well as you can and then stir into the flour mixture. It will work just fine.) Add in the butter and pulse until the mixture resembles coarse meal and the largest butter pieces are the size of peas. Add in the water and pulse just until the dough comes together. Remove from the bowl, form into a disc and cover with plastic wrap. Transfer to the refrigerator and chill 1-2 hours, until firm. This can also be done in 1-2 days in advance. 2) Transfer the chilled dough to a lightly floured work surface. Roll out into a flat round sheet about 12 inches in diameter, or large enough to fully line a 9-inch pie plate. Transfer to the pie plate, trimming away any excess at the edges and crimping the dough to create a fluted edge. Transfer the pie plate to the freezer and chill 15-20 minutes, until firm. 3) Preheat the oven to 375˚ F. Line the chilled pie shell with aluminum foil, making sure all edges of the crust are fully covered. 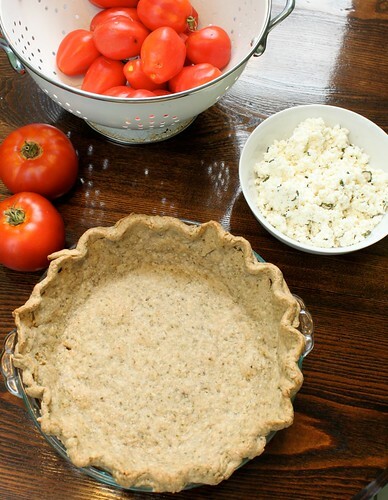 Fill the pie shell with baking beads if available to weigh the crust down (dry beans or rice also work). Bake for 25 minutes. Remove the foil and baking beads, return the pie shell to the oven and continue to bake until the crust is golden and fully set, about 10-12 minutes more. Transfer the pie plate to a wire rack and let the crust cool completely. 4) In a medium bowl combine the ricotta, garlic, and herbs. Stir together until evenly combined. To give the ricotta a smoother texture (if needed), stir in 3-4 tablespoons of milk until evenly combined. Season with salt and pepper to taste. Spread the ricotta into the pie shell in an even layer. 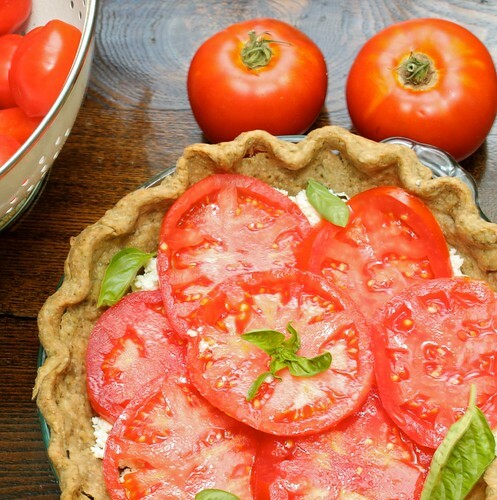 Layer the tomato slices on top of the ricotta, drizzle lightly with olive oil, and season with salt and pepper. Garnish with additional minced basil. Slice with a sharp knife and serve immediately. So I celebrated a big one a few weeks ago. Yep, a whole year has passed. Since my brother and I were born on the same day, our birthdays were always a big deal. It all started when I was 6, and my brother was turning 1. Tell a six year old that they have to share their birthday after 5 years of flying solo, and well, it could’ve been a little rough. Instead my parents went over the top and had an all out celebration with a tiered cake, our whole family, and a clown who doubled as a magician. I still cheered when the clown told me he was going to make my brother disappear, but overall, I LOVED sharing a birthday. This year was no different. It’s been pretty great being back in Ohio and being able to once again share birthdays with my favorite brother. I insisted on making the cake, because it’s the one time of the year I don’t feel bad about going all out with an over the top birthday cake. Six layers was obviously a necessity, but because I didn’t want to be eating leftover cake for weeks, I thought 6 inches was perfect. 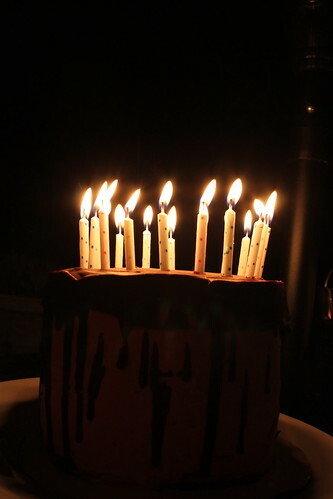 The only problem – I didn’t have any six inch cake pans. Thankfully whole foods came to my rescue. I noticed they sold 6-inch cakes and jokingly asked the baker if she had any pans for sale. Well it turns out they bake all their cakes in disposable paper rounds – and she gave me 3 for a buck, steal! Makes 1- 6 layer, 6 inch cake. Preheat oven to 350° F. Prepare three 6-inch round cake pans with butter, parchment paper rounds, and flour or cocoa powder. Tap out excess. In bowl of electric mixer, sift all dry ingredients. Add all remaining ingredients to bowl with the dry ingredients and with paddle attachment on mixer, mix for 2 minutes on medium speed (you may need the plastic splash-guard that comes with mixer) and pour into prepared pans. If possible, use digital kitchen scale and weigh pans for even layers. Batter will be liquidy. Bake for 20 minutes and then rotate pans in oven. Cakes are done when toothpick or skewer comes out with a few crumbs, about 30 minutes total. Try not to over-bake. If using raspberry puree, place a handful of fresh or frozen raspberries in a food processor, and process until a smooth. Press through a mess sieve to remove seeds and retain at least 1/4 cup to add to frosting. Add raspberry puree to taste and if desired a few fresh raspberries, and blend until combined. Add small amount of pink food coloring, if desired. For the Whipped Chocolate Ganache. Heat heavy cream in a small saucepan until just before boiling. In a heat safe bowl, pour cream over chopped chocolate. Let sit for ~5 minutes, then stir to melt chocolate. Whip mixture on high until it becomes paler and fluffy, about 2-4 minutes. Place the chocolate, butter and heavy cream in a medium heatproof bowl over a pot of simmering water. Stir the mixture using a rubber spatula until melted and smooth. *Be careful to not get even a droplet of water into your bowl of chocolate and butter. Slice the 1st cake layer in half horizontally, using a large serrated knife or dental floss and place cut side up on your cake board, pedestal, or plate. Using a small offset palette knife, spread approximately 1/2 cup of whipped ganache evenly on top. 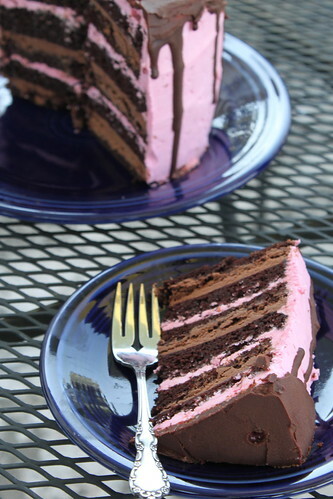 Add a layer of cake and cover with about 1/2 cup raspberry buttercream. Repeat this with remaining cake layers, until you come to the final layer, which you will place face-down on the top of the cake. Place cake on a turntable (if possible), and using a small offset palette knife for the top of the cake, and medium straight palette knife for the sides, cover the cake in a thin layer of buttercream to seal in crumbs. Refrigerate for 30 minutes (or more). *This does not need to be perfect, as that will come with the top “coat” of buttercream. If glazing the cake, make the glaze and set aside for a few moments to cool a bit. Pour glaze over chilled cake, smoothing the top with a clean small offset palette knife. Chill again to set, serve at cool room temperature.